<— Oh you KNOW I was on the edge of my seat for an entire year for this book. I am a MADDOX-MAN devotee, and I couldn’t wait to indulge in yet another angsty-feisty-firey Maddox alpha male full of romantic passion and jealous rage. I know, I know… doesn’t sound healthy of me to swoon over a guy that is that intense, and all claim-ey-like, but I can’t help it. I LOVE THEM. At least the “book-them”. Ahhhh I’ve been through this before, with y’all. You know I can’t help myself. Travis was my very “first” of this kind of guy, and I was swooooooning. Screaming about him from the rooftops, and then chastising myself when he’d pummel yet another guy that got too close to Pidge. Having to remind myself that he might be more of a “run away fast” kind of guy (if you ask those not already in love with him). But I went with it, and I don’t take a moment of my Travis-love back. In fact, I love him more with each new “book-boyfriend” I meet. Even the gorgeous, equally alpha, equally hot, almost identical to Travis in every way, Trenton. Oh don’t get me wrong. If you loved Travis, Trenton will likely satisfy that Maddox-sweet-tooth. How lucky are we that the author plans to give us a book for each of them? I’ll read each and every one. Of course, I still have my favorite (so far) and yep, even as much as I enjoyed this one, my beloved Travis still owns my heart. But ANY time with a Maddox man is a good time for me. ‘Cause you know what? Those guys just DO it for me. Cami is struggling in her relationship with her boyfriend TJ. He’s gorgeous, he’s successful, he’s BIG. Strong. He’s everything she wants. Yet… he’s too career-driven to give her the time their relationship needs to thrive. And when he moves away to California for his job (and they attempt a long distance relationship), Cami suffers. TJ seems to love her… but. You know how that goes. I think Cami loves him more. And the fact that TJ is sort of a mystery, and there’s this big secret looming overhead about him… them… well. I was suspicious. Enter Trenton. A known “player” (in fact, she went to high school with him) and has avoided him like the plague. “Who does that?” I said turning to see where he went. He’d already disappeared into the crowd. She knows ALLLLL about the Maddox brothers and does her best to steer clear of them. “I have a boyfriend.” I reminded him. *sigh* <— My actual NOTE in my ebook was “swooooooooooooon“. Cami’s got a bad family. A bad childhood. An abusive father. An abused mother. And you already know a bit about the Maddox-clan. Great father, bruiser brothers, deceased mother <— SO sad. But Trenton has an added heartache. An accident that caused the death of his girlfriend. But let’s talk about Trent. Trenton looks like Travis. Is slightly older than Travis. As strong and protective (and practically unbeatable) as Travis. Trenton is just as much of a sweetie as Travis. Maybe a bit more level-headed (which is a PLUS in many of us alpha-lovers books). Unlike his brother, I could tell that Trenton would rather not fight. He just wasn’t afraid to, and like the other Maddox boys, it was engrained in him as a default option for solving a problem. Some might even consider him “an upgrade” from Travis because of all that. AND!! Trenton is full of that blazing ferocity. Yah, but to me, Trenton is puurrrrrfect. <— YES. I just purred. So why am I not head-over-heels with him? Well… I am, if we only consider Trenton. But honestly? I don’t know. He had everything I look for in my ultimate book-boyfriend, AND he had that “Maddox” plus, but… while I read this entire book in practically one sitting, and while I found my hand on my chest at times, feeeeeeling him (them), I never found my “love fog”. With Travis (on my first read AND all of my consecutive reads <— yes I read it 5 times, so my Travis love was not a fluke), I find myself in a love fog for at least a few days. Unable to start any other book, while I indulge in my over-the-top book-crush, each and every time. So that’s it. Just that. The fact that, while I loved reading this, I didn’t completely lose myself to it. Lose myself in Trenton, like I did with Travis, and for that, I’m giving this one 4 stars. Great read, entertaining, a big secret that will keep you guessing and a *boom!!! * reveal that will have you backtracking (either in the book, or in your mind), trying to find the clues and associate them with the truth. So all of that is good! But I also found myself tripping over a few details, which may be the other reason I didn’t lose myself. SKIP THIS NEXT PART if you haven’t read this yet. I won’t spoil it, but I will analyze a few of the parts that held me back, somewhat. “She has a boyfriend,” Trenton called to her, staring into my eyes and grinning. Can’t you just SEE that perfectly?!! I mean, I can practically see the twinkle in his eye, his bratty posture as he leans on the counter, staring at her, grinning like a brat, while talking about her as if she’s not even there. Yep. Their dimples, their brooding facial expressions, their silly, bratty actions. SO REAL. Trenton leaned down and grabbed my hands, forcing me to smack myself in the face a few times. It didn’t hurt, but being the little sister of four brothers, this, of course, meant war. Tee hee!! Maybe that’s what I love most about the Maddoxs. They are silly. Fun. Bratty. GORGEOUS. And they’re total guys. “I didn’t kill her,” Trenton said quietly. “Yeah,” he said. His eyes lost focus, and I could see that he wasn’t. I knew exactly what it was like to get lost in a bad memory, and even over a year later, just one mention of the accident had sent Trenton down the rabbit hole. When they’re happy, we can see it. When they’re furious, we can fear it. When they’re sad, we can feel it. However, yes. It is VERY possible that Travis has ruined me for all (many?) others, as I read ’em. Perhaps even his entire Maddox clan. I’m willing to give them all a go, though. *blush* <— OMG did I just say that!??? 2.) The whole “Trenton’s always been into her BIG time” reveal was a great bit of detail (helped nix that whole “insta-love” issue since they’ve known each other since they were children). But my problem? I didn’t feel it. I knew it, but I didn’t get to experience it (as a memory, or as a private conversation, or as a deep, heartfelt confession). Perhaps had there been some “backtracking” memories from their childhood, in their teens (even through her eyes) that would have hinted to her that she *might* be special to him… that might have helped me feel that long-time slow burning love, but it was more of just a “fact” that was told to us every once in awhile as their current story progressed. 3.) The similarities to the Beautiful Disaster storyline. The friends-only, the push and pull, the “EVERYONE KNOWS BUT YOU!! !” moment. <— Er… wait. Those are also the parts I LOVED! See? I can’t make up my mind. One part of me says too similar to BD, but the other part of me says… “but THAT’S what I loved!! !” <— *sigh* Who knows what my problem is? But romance-wise, this one almost seemed… faster-paced. Or maybe too easy-ish. It didn’t have me to be DYING for it, you know? I wanted it, but I wasn’t drowning in it. 2.) What else I loved? I loved that it all happened during the same timeline as Travis’s story. It was as if I was home again, just living the Maddox life through a different set of eyes. Hey I’ll take ANY set of eyes if I’m living amongst the Maddoxs. 3.) And! I loved how often Travis was in this one. We actually get to see him in some of the off-screen moments that we experienced through Abby’s eyes in Beautiful Disaster. Remember those girls he met at the bar and took home? YES. THAT NIGHT. UGHHHHH!!!! THIS ONE has us at the bar with him, meeting them… yep. Even more glimpses into Beautiful Disaster, and I won’t say no to that. P.P.S. CAREFUL going down in to the comments… lots of stuff sort of said (or might be said) that could be spoiler-ish so if you haven’t read this yet, I suggest holding off reading the comments… (or skimming lightly, if you must). I also went back to the last chapter and read it again! What did I miss? I read this book in one day also Maryse and I agree with you 100%. It was a 4 star read. I think we are sooooo in love with Travis that Trenton never had a chance. I didn’t want to know the ending. I WAS HOPING I was wrong!!!! Then BAM!!! The twist was so good. Now I know who I am interested in. This was not a 5 but at least a 4.5 for me. I do love me some Trenton. I love his relationship with the little neighbor friend. regarding the twist and it’s been eating at me!!! I figured it out early on. I felt exactly the same way you did. I liked that it was the same timeline as bd but at the same time I’m bored of visiting this story line for the third time. I also feel like important things left unanswered but like you said, “patience young grasshopper” maybe more will be revealed in later books. It was 3.5 to 4 star read for me, kind of felt like a filler novel and I think Trent is so awesome he needed more. Struggling to pay $7+ for an e-book. I get it that authors need to make money but……her e-book rarely go on discount too. So torn……ugh….Christian being my first ‘fantasy’ male read but Travis- he was my first ‘realistic’ alpha male read- swooning! Maryse-convince me to pay $7+ for this. I totally guessed it. From the very beginning, I just kept saying to myself “please don’t let ** *** *****.” However, the actual reveal shocked the hell out of me. I loved Trenton but I’m still totally a Travis girl and I can’t wait for the next one. Oh yes, I’ll be devouring the next one, too. I’m a Maddox-girl! I agreed with your review. I just wanted to love this book as much as BD but it was sooo safe and I just didn’t feel it! Loved Trenton & wished there was more to the plot. I kind of guessed the Big reveal 1/2 way into the book. Still looking forward to the next Maddox Brother books! The reveal kinda ruined it for me….and made me mad. I figured “the Thing” out with in the first couple of chapters. I was really disappointed in this book. I guess my expectation for this was set very high because BD is one of my all time favorite books. But this book just didn’t do anything for me at all. I felt like Trent deserved more. OK… I figured out the “twist” REALLY early. I was sooooooo disappointed. I think Trenton deserved a much better storyline. His story was overshadowed by TJ. BO left me with so many unanswered questions. I cannot say too much because I do not want to include any spoilers. I rated this book a 2.5 – 3 stars because of them. Hopefully, Jamie McGuire will be able to pull off the next one… my fingers and toes are crossed. Especially since out of all the Maddox brothers (except for Travis), he is the one I am most interested in reading and learning more about. OHHHH… if there is a follow up to BO like WD (which I loved BTW) all bets are off!!! I will not be reading any more about the Maddox brothers. AND that my friends will be a sad day for me. Maryse ~ have to tell you… I LOVE your blog!! Half way trough i really suspected the ending. The ********** and the no ******* where a big giva away for me. I really loved the book, and would love for a Trent’s POV book like WD. Like most of you, Travis still owns my book boyfriend heart. But I still *loved* Trent. His relationship with his little neighbor had me swooning! I was left puzzled over several things with Trent, though. I would like to have known more. Maybe we’ll be getting Trent’s POV? Wow awesome twist!!!! I too reread the last chapter and now skimming through the whole book again!! Absolutely loved this book. Wonder when the next one will be out and about which Maddox brother!!! Really confusing ending, maybe I’m just dumb, didn’t get it?? Is TJ a ******* *******?? I figured it out about half way in with the references to California then his job. I wish I would have had that “what just happened” moment but I still loved every moment of the book. Totally don’t get the ending..I guess I missed something?? Will someone explain it to me? I can’t believe how disappointed I am in this book. I was so excited for it to come out as I am a massive Beautiful Disaster fan. But … come on, how could you have not worked out who TJ was from about the second chapter? If you have read Walking Disaster (which I loved !!) then you really have no excuse. It’s so obvious. 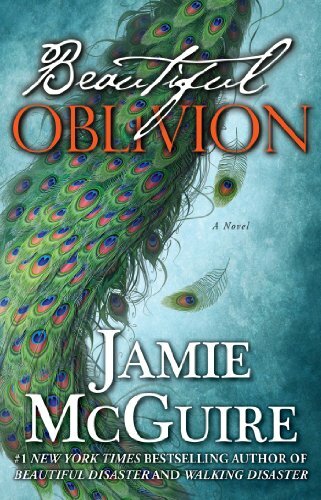 I usually love Jamie McGuire’s writing and have read all her books, but there was just no sexual tension or build up between the main characters in Beautiful Oblivion. There were a lot of unnecessary characters and a lot of sub plots that were never expanded on and left me scratching my head. I’m so sad. It wasn’t obvious to me, because I was too busy focusing on the accident, and thinking “stuff” about that and where TJ could be involved… (perhaps the reason TJ was so much of a secret). The hints that were provided about him could have been any guy, I just assumed another reason as to why he was a secret. Whattt is the twist i dont get it!!!!!!! Can you tell me the twist before i pull my hair out!!!! Maryse, was I the only one falling for T.J..??? I loved the reveal at the end. I was not expecting it… I loved this book but I agreed with you, I wished there was more about Trent so I could connect with him in the same level I did with Travis in B.D. Emma… I take it you did not read Travis’ POV in WD. The epilogue does clarify any questions you may have. However, I know some people did not like reading the book because it was so similair to BD. BUT there are many of us that can never get enough of Travis!!!! Anyway, I do not believe anyone in this group post is willing to spoil the ending for people who did not read it. If you would like me to tell you, you can personally email me at [email protected]. I do have a facebook account but do not use it. Minha… I agree with your comments and feelings about TJ. I wish I could say how much so but again I do not want to spoil it for everyone else. I am really looking forward to his book. Even thought BO was supposed to be Trent’s book, I felt it was more Cami and TJ’s story then Trent’s. There was so much more we could have learned about Trent. This is the main reason I did not really enjoy this book and wholeheartedly agree with Karen C’s comments. I’m ubber upset! I feel as though tj got the short end of the stick. I love all the maddox men, but bd was a 5 in my list and this just doesn’t compare. Maybe if it were the first book I wouldn’t feel so let down. Oh, and I’m still angry at Cami. Really?!?! Yup…MIND BLOWN! T.J.? Really just freaking really. (Exhale, woooo saaa) just wow. WOW! OK, I know I’m not the only one, but I dont get it. I get the big omg moment but I don’t get why it was a secret. His name, identity, job. Who cares! Why keep this from family and friends? I read some blog telling that you need to read walking disaster epilogue before reading beautiful oblivion, i wish i didnt ..when im reading the beautiful oblivion i kinda know the twist at the end.. I miss shock factor everyone talkng about. . I totally understand why TJ cannot tell people what he actually does for a living. Think back to WD. At end of BO (sorry, the abbreviation makes me laugh), TJ told Cami everyone knew about them but he would rather not tell them about him. Simply put… He couldn’t. It is too personal and close to home (so to speak). Regardless, TJ is still one character I would like to know more about. Even though I truly want to throttle him because of his relationship with Cami. BTW ~ Wasn’t this supposed to be Trent’s story? If so, then why do we all seem to have more questions about TJ and still no answers about Trent!!! I didn’t understand what the big secret was it must have gone way over my head can someone please explain it to me !! I just finished Beauiful Oblivion and the secret was definitely lost on me. I may have it figured out, but I want to know for sure! Got this book for my bday – haven’t read any of the others, and I can honestly say I was really really annoyed by the end. Maybe I should read the others so I can get my head round it but maybe not appropriate with a husband! I just keep coming back to the comment that was repeated many times during the course of the book that everyone knew Trent loved Cami since they were children. T.J. has alot of explaining to do and I would have loved for that conversation to be included in the narrative. The boys were too chummy at Cami’s bedside for my liking. The whole scene didn’t seem to hold true with the Maddox boys’ characters. Definitely felt short changed. I am so confused. What is the secret twist? What is the big deal about them **** *****? What am I missing? HELP me to understand it is driving me crazy. Besides being the oldest Maddox brother and Cami’s ex-boyfriend. Who is TJ? What is TJ? I don’t understand. Give me the digs. I don’t see a twist in being brothers. Ok IAM ADDICTED I need more. I’ve read them all including A Beautiful Wedding. I see at least another two books here and thick books at that. . Okay so I don’t get what the big secret is. Can anyone tell me what I missed here? I reread the two chapters before the reveal an am still confused. What is the big deal if they are *spoiler*? Can anyone help me out? Hi Mary! I’m not sure if I looked hard enough but I was searching for your reviw on Beautiful Redemption and I didnt see any. I’m almost through with it but have stopped with 30 pages left because I don’t want it to end! I love jamie’s writing and Thomas’ story in Redemption is just as entertaining and heart wrenching as Disaster and Oblivion! Let me know if you’ve gotten a chanceto read it! Definitely recommeneded!!!! I had no idea about the twist, I literally cried and laughed at the same time and now I feel like I need to re-read the book. However Travis is still my favorite. I was so confused! I think I’ve finlly got my head around it. The reason Cami couldn’t choose or say anything was why? Why would it have ruined things? Wo they were beothers after all? That’s why? ARGH. I feel like such an outsider haha. Halp.